Home / Blog / Safe to say – our bees are nice ones! 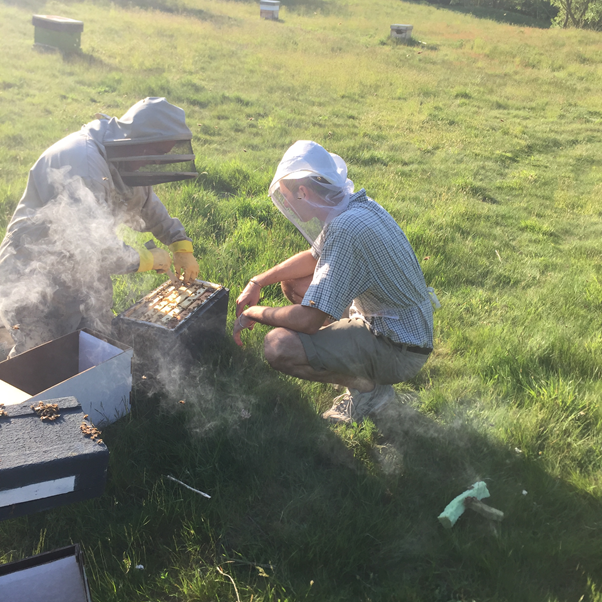 Perry arrived at the training apiary this week to inspect and collect some nucleus’ of bees. We were a little surprised therefore when he turned up in shorts and short-sleeved open shirt, bare legs and arms. He announced that he hadn’t brought with him a bee suit/jacket or gloves, and that normally he doesn’t even wear a veil! In the end we did convince him to wear at least a veil…. But….Thank goodness our bees are gentle, and the proof was that he transferred his nucleus’ to travelling boxes without a sting. I’ve now witnessed a beekeeper who really is hardy!